where to get replacement throw wheels for ball machine? I have a silent partner ball machine. The two throw wheels are worn. The factory charges $150 for two wheels plus $20 shipping... Just wonder if anyone knows a source for that kind of plastic rubber wheels. Worn on the surface or the wheels' bearings are worn? Have you vigorously cleaned the surface of the wheels (with abrasive material) if the surface is at issue? That is a pretty specific application, so I doubt those are commonly available, off the rack wheels. If the surface is too slick to grab the ball and propel it, cleaning with abrasive pads may be the solution. Have you tried this? Or, is there some other symptom? How long have you had the machine? That sounds like a good plan -- clean it up and use it so long as it is functional. If you ever have an issue with the wheels having so much residue on them that they won't throw the ball, get a bucket of hot water, add an ample amount of cleaner/de-greaser and use this to clean the wheel surface. Wearing a heavy glove for protection, use the largest gnarliest abrasive scrubbing pads you can find at Home Depot to clean the wheels while the machine is running (set at lowest speed at first). Just lightly touch the wheel surface and pay attention to what you are doing. Sand paper can be used after that. I have also used Barkeepers Friend in this process. It doesn't take long and is effective. Regarding the machine being noisier than before could be a sign of motor wear. These are simple electric motors that should be easy enough to replace. I have had a Silent Partner Star for 6 years now and it is still going strong. I have cleaned it a couple of times, had to replace my smart charger once and, of course, replaced the battery whenever it dies. Support from Silent Partner has been excellent. The wheels may simply be deteriorating - that's what happened to mine. 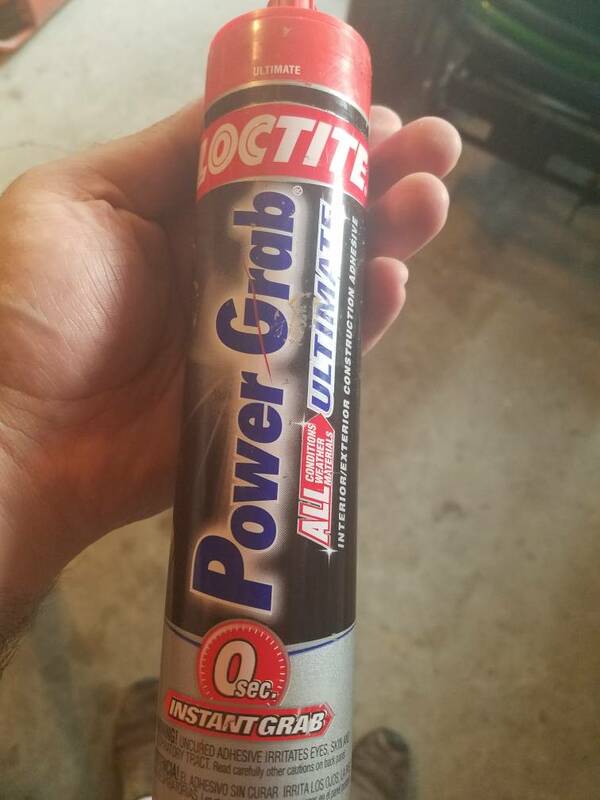 I've had mine for 7ish years and used only about 40 hours. This summer, after about 15 minutes of use, the balls lost all velocity and the propulsion wheels started spitting a tar-like substance out the front ball opening. I called SP and they said this can happen on older models. The coating just breaks down over time. Ugh. I know this is an older thread, but frankly it's the only thread about this. I recently received a Silent Partner Pro. I am in the process of changing the batteries and I noticed the black coating us coming off. For those that had this problem, what was your solution? I am almost wondering if this could be a job for a roll of electrical tape. Definitely not electrical tape because the wheels must have grip. 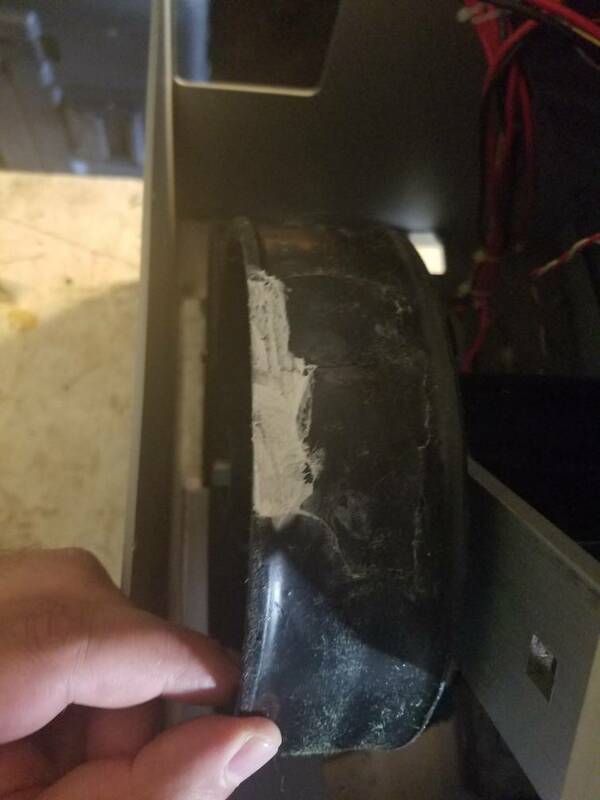 There has to be some sort of solution where you could resurface the wheel with something. What about leather? Could you epoxy some leather around that? Of course, I’d try to remove all of the old first. It has to be something that’ll fit right and be grippy. This is one of those moments where I’d normally ask my uncle who passed a couple years back what he’d do. He was an auto mechanic for years and always had great advice. Silent Partner has outstanding customer service so I know they’re not trying to get rich off of this transaction. My last concern would be to wonder if this machine just met the end of its life expectancy. Yeah it's a tough call. I bought the machine for $50. The new batteries come in tomorrow and I will then be able to test it out "as is". I did find 2 large pieces of that rubber coating inside the machine. I think I will attempt to glue it on. If I were you, I would order them right away. Wheels with motors is 30% of the ball machine. Price seems to be quite reasonable, compared with how much a ball machine costs and how significant this component is in the design of the machine. Looks like you are getting a good deal on this, considering that wheels alone were priced almost the same amount. I think you are right. Even if this patch job works, it is inevitably going to fail. Wonder if tar paper or something like it with an adhesive backing would work? You would have to clean all the old stuff off, but a couple of layers could be fitted onto the wheels. Just tossing out an idea. Wheels come in contact with a barely moving ball and accelerate it to 30 to 80 mph on a distance of 20-30 mm. The forces between the wheels and the ball are very significant. Wheel rubs against the ball and accelerate it through friction. There is a fair amount of slippage going on while ball accelerates. 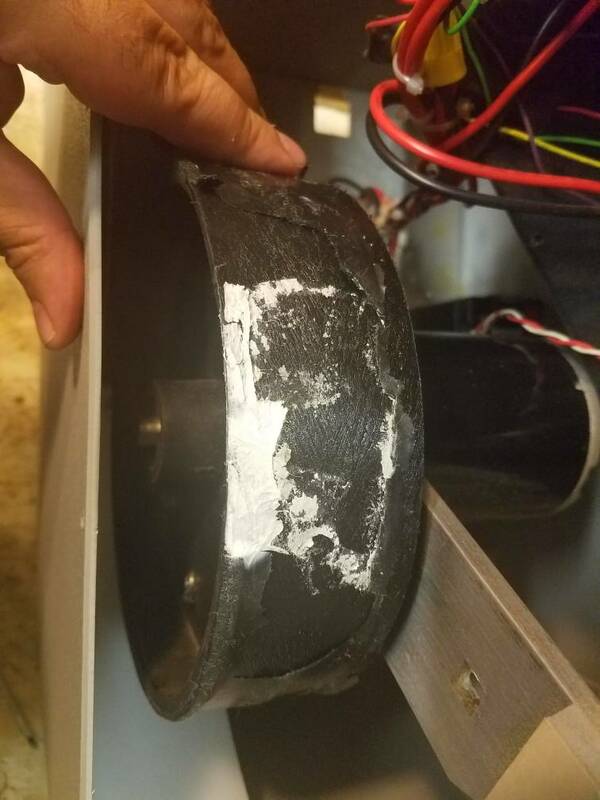 We will learn very soon if pletcha2002 attempt to fix the wheels works, but I have my doubts that it would last a significant time, especially considering that not the whole wheel is patched, as the latest picture shows. If that white hole is left, forces of friction will likely start ripping the patch right from there. It is the first time I see a picture of wheels in Silent Partner. Until now, I only saw wheels in Playmate. Very interesting how significant the difference in design is. Thank you for sharing! Alright, I have an update! The batteries came in today. Of course I needed F1 terminals and I received F2 terminals. That sucked, but I know they make adapters for them and I have a home depot and an Advance Auto parts store right down the road. Do you think anyone would have them.... nope. I try to buy things locally, but it is becoming harder and harder to do so..... anyways, now I am pissed, so I rig one of the batteries to temporarily work so I could test out my wheel. Fired it up, turned up the wheel speed and instead of throwing balls at me it shot more of the wheel at me and sounded like a cargo plane hitting turbulence. They spin so fast, the only option I can see is replacement. It was worth a shot, but no dice. I emailed Steve to place the order. If you guys are interested in continuing this journey with me, let me know and I will keep posting my updates. Please update as you have them. This information could be helpful for others in the future. While I'm not having any wheel issues, this thread has none the less been informative. While it would seem that some type of material, epoxy, etc. ought to be able to solve/fix this problem......one issue that kept occurring to me would be BALANCE!? At such high speeds any repair would have super balanced......not just centrifigal but also side to side. 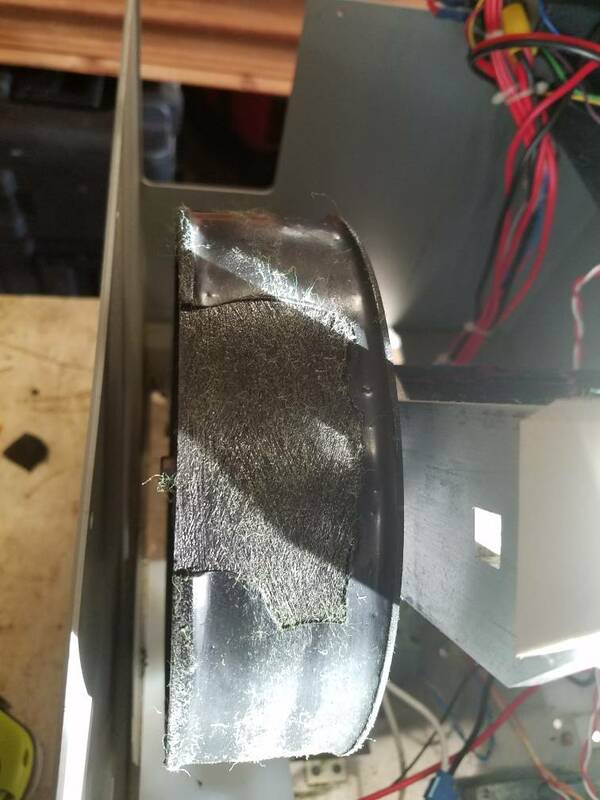 once a rubber or plastic substance gets sold old and ry that it is cracking and falling apart like this, there is no way to rejuvenate it that I know of. Just gotta splurge for new wheels. 3d printers are getting better and better with the materials they can work with. "Right to repair" decision from SCOTUS and refillable tone ink cartridges are pointing the way to the future.